Proudly referred to as the ‘open art gallery’ of Rajasthan, the region of Shekhawati is decked with colourful havelis, gorgeous palaces, majestic forts and ornate temples, making the region one of the most regal in Rajasthan. Shekhawati is known for producing some of the bravest men in the country and has a history of having some of the most courageous rulers. Shekhawati is filled with glorious tales of the past that make the land interesting, mysterious and a perfect haven for a historian. With towns like Mandawa, Jhunjhunu, Fatehpur, Nawalgarh and Dundlod, Shekhawati, is one of the hot spots for tourists and scholars. You can also find some of the most beautiful handicrafts, jewellery and clothes in the region. Home to several splendid havelis, Mandawa is one of the most fascinating towns in Shekhawati. The town is located in the Jhunjhunu district and is believed to have been built during the 18th century. Some of the most renowned havelis in the region are the Saraf, Goenka, Chokhani, Ladia and the Gulab Rai haveli. you can take a closer look at these havelis by spending a night in one that has been converted into a luxury hotel. The forts and havelis of Dundlod, are known throughout the state of Rajasthan. Located in the heart of Shekhawati, Dunhdlod is a town that has a unique blend of Mughal and Rajput architecture. Some famous havelis in the region are the Jagathia Haveli and the Goenka Haveli. These haveli are filled with opulent interiors and not to forget priceless frescos. Some of the havelis have some breath taking interiors with stain glass windows and paintings. Founded in 1737 by Thankur Nawal Singhji, Nawalgarh is considered one of the most modern towns in Shekhawati. The city also home to some of the big business families of the country. Apart from that, Nawalgarh is home to many forts and havelis, including the Anaadilal Poddar Haveli, Aath Haveli, Jodhraj Patodia Haveli, Chokhani Haveli and the BAnsidhar Bhagat Haveli. Founded in 1620, Churru is yet another place that houses beautiful havelis and forts on its land. Also known as the getaway to the Thar desert, Churru, is famous for its golden sand dune landscape dotted with mesmerizing forts and havelis. Churru is home to the Surana Haveli which has more than a thousand doors and window, the Kanhaiya Lal Bangla Haveli and the Kothari Haveli. 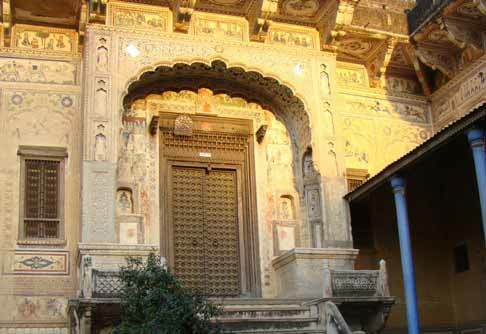 Jhunjhunu, named after the Jat chieftan Jujhar Singh Nehra, is home to several beautiful havelis and forts. Some of which include the famous Khetri Mahal, Modi Mahal, the 19th century Tibrewala Haveli and the Mertani Boari. Jhunjhunu also has some famous temples to visit like the Biharji Temple. The town is also famous for some of the finest handicrafts which are proudly displayed at their bazaars. Apart from these very interesting places to visit, Shekhawati is a must visit during the Shekhawati Festival. Celebrating culture, art and tradition for almost 15 years, this festival is one of the best displays of Rajasthani art, craft and culture. Other places that are also a must visit in Shekhawati is the Bissau, Laxmangarh, Ratnagarh, Sikar and Mahansar.